For courses in Introduction to Creative Writing or Creative Writing in English or Creative Writing Departments. Written by bestselling author Janet Burroway, Imaginative Writing, covers all four genres: creative nonfiction, fiction, poetry, and drama. This textbook discusses elements of craft common to all creative writing before delving into the individual genres. After an introduction, the next five chapters each investigate a specific element of craft—Image, Voice, Character, Setting, and Story—from a perspective that crosses all genres. Nearly half of the selections in all four genres are new. New "Try This" exercises give students plenty of practice. 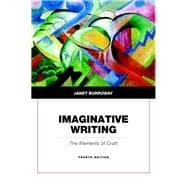 Imaginative Writing is a very popular book for courses on teaching the craft of creative writing. Do He Have Your Number, Mr. Jeffrey?